I cannot believe it is August already! It is crazy how even a day seems long, the entire year seems to fly by. Even though summer is almost over, I have been major crushing on some beauty and fashion goodies the past month. Starting with beauty I’m not gonna lie with the hot weather has been pretty simple on a day to day basis. First it starts with a good base and the Stila serum foundation has been perfect for everyday! It is light enough that i don’t feel like cake face but gives me enough coverage to hide any pimples that may pop up. 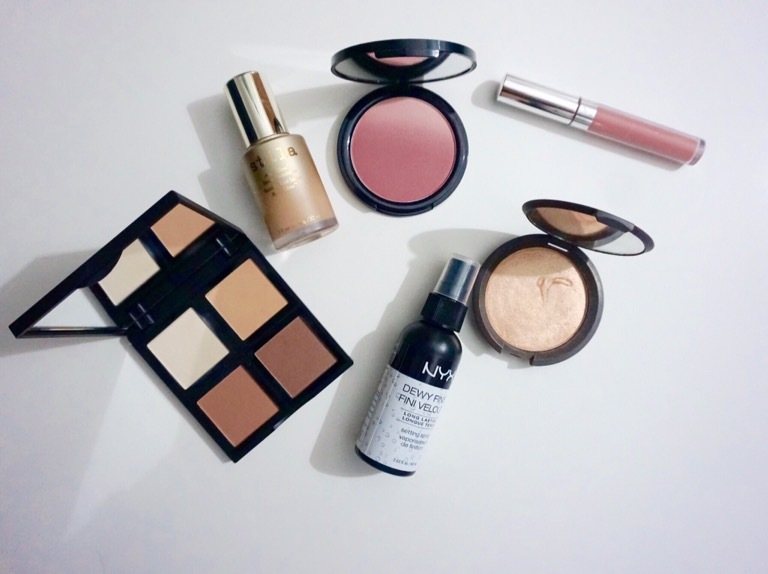 My next obsession of the month has been a strong contour! I discovered this e.l.f counter palette and for $6 I had to make it mine! For the awesome price, the colors have enough grey to create a good shadow without making you look like a zombie. For blush can we talk about how pretty this ombre blush from NYX is! It is so pigmented and while i don’t notice an ombre appearance on my checks, the packaging is pretty. I got a suave color because going into fall it is such a great neutral color for any skintone. And I cannot talk about favorites without mentioning a highlighter! The Becca x Jaclyn Hill Champagne Pop highlighter makes you glow so hard, people may fall over! Seriously though it amazing even though I’m on the pale side it still blends in beautifully! Lipsticks are always my favorite and liquid lips have been on repeat all summer. I love the color midi from Colourpop and to keep it from drying out my lips too much I top it with a gloss making the perfect combination! Finishing off my beauty favorites is a finishing spray! Another NYX product, this spray keeps my face hydrated and just feeling amazing throughout the day. Fashion of course has to make an appearance! I have been living in this outfit for the last couple weeks! This printed maxi skirt is so light and flowy it makes a perfect thing to grab for on a hot day. With so many colors in the skirt, options for a top are pretty endless but for a casual everyday look I grab a white t-shirt and call it a day. For my feet I normally wear heeled sandals but my new shoes from Missguided are giving me life! While they are not everyone’s style i love how simple they are and can really give an edgy vibe to a basic outfit!